Learn about all of the important things in early childhood from ages one through six. At one, you've found your nose and discovered your toes. By five and six, you've learned some tricks. 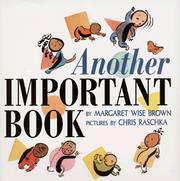 Brown, Margaret Wise, “Another important book,” Children's Picture Book Database at Miami University, accessed April 24, 2019, https://dlp.lib.miamioh.edu/picturebook/items/show/6348.